After Minister Shinzo Abe reshuffled his Cabinet this week with veteran politicians support for his government rose sharply, several Japan's newspaper polls showed Wednesday. Three newspapers - the Yomiuri, the Nikkei and the Mainichi - showed support for Abe's Cabinet rising more than 10 percentage points since he named a slate of new ministers on Monday. Abe's government has been rocked by damaging scandals since he took office last September, leading to a punishing defeat in July 29 elections that gave the opposition control of the upper house of parliament. The Nikkei, Japan's leading business daily, showed the Cabinet's approval rating rising 13 percentage points to 41 percent in an Aug. 27-28 poll by Japanese business daily Nikkei, up from a poll taken July 30-31. The disapproval rate fell to 40 percent, from 63 percent, according to the Nikkei. The Yomiuri, Japan's largest daily, said the approval rate rose to 44.2 percent from 31.7 percent in its July 30-31 poll, while the disapproval rate sank to 36.1 percent from 59.9 percent. 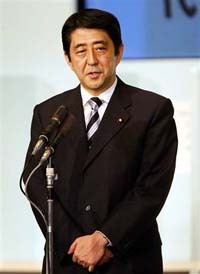 The Mainichi said Abe's support rate rose to 33 percent from a record low 22 percent in an Aug. 4-5 survey. About 70 percent of respondents to Mainichi said they don't want Abe to stay in office for long, however. "I think what's important now is to push forward with government policies," Abe told reporters Wednesday when asked about the poll results. Abe, whose ruling party still controls the powerful lower house, has rejected calls to resign following the election loss, and on Monday tapped a group of party heavyweights and political veterans for a Cabinet reshuffle. Newly appointed Chief Cabinet Secretary Kaoru Yosano said he was satisfied with the poll numbers. "The Abe Cabinet, the government and the ruling parties are now at a point where together we will ... start making efforts that should lead to further increases" in the polls, he said. Nikkei interviewed 687 voters while Yomiuri conducted its survey with 1,036 voters. Mainichi got responses from 924 voters. All surveys were conducted by telephone and no margins of error were provided.